I swear on pregnant Scarlett Johansson’s unborn child that I’m not making up the $1,549 figure for Microsoft’s new Surface Pro 3 tablet. Indeed that is the price for one of the high-end versions of Surface Pro 3. No, don’t even ask. For $1,549, you will not get the Type Cover. Be prepared to fork out additional dollars for those must have add-ons since Microsoft is pitching Surface Pro 3 as a laptop replacement for businesses. I can’t say for sure but just between you and me I suspect the Surface team at Microsoft is really high on Sonoma County Sour Diesel, a popular strain of weed among developers on the West Coast. I don’t want to piss on the Surface parade but sales of Surface tablets that were far cheaper than $1,549 have not exactly been gangbusters. Some 19-months after the launch of the first Surface tablet in October 2012, market-share for Surface tablets languishes around a piffling 2%. Nomura Securities estimates Microsoft has incurred operating loses of $2 billion on the Surface mis-adventure. So can Microsoft jump-start sales of Surface by calling its new tablet a laptop in tablet garb and targeting it at businesses? I don’t think so because I fail to see businesses clamoring for tablets in a big way. Second, these are pricey devices with limited storage (system software usually take away a big chunk of advertised storage). For instance, a 64GB version of Surface Pro 3 will provide buyers only 36GB of usable storage. Microsoft opted for the latter today. Sales of Surface tablets may be embarrassingly small but that’s not coming in the way of Microsoft thinking big. 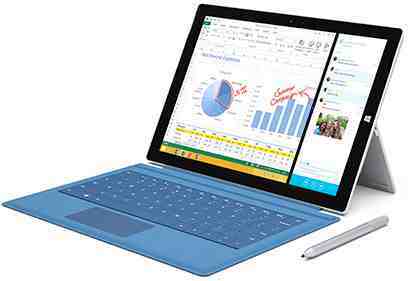 Confounding expectations of a Surface mini tablet, Microsoft launched a larger screen tablet today at an event in New York City presided by its new CEO Satya Nadella. Running the Windows 8.1 Pro operating system, the new Intel processor based Surface Pro 3 has a 12-inch screen, a 3:2 aspect ratio, a 2160 x 1440 display, is 9.1mm (0.36-inch) thick and weighs 800 gms (1.76-pounds). Microsoft is promising battery life of up to nine hours for web browsing. There’s 5MP front and rear cameras. A full-size USB 3.0 port, microSD card reader and Mini DisplayPort are part of the Surface Pro 3 hardware and allow for quick file transfers and easy connections to peripherals. So a new Type Cover is de rigueur. Microsoft still does not get it. As the tablet market starts to slow down and the world greedily ogles cheaper Android tablets like Xiaomi’s new $239 Mi Pad, Microsoft bizarrely hungers for sky-high prices for the Surface. For tablet vendors, the devices have mostly been a consumer phenomenon, not a huge business opportunity. Now when the world goes in one direction, you move the same way unless you happen to be Apple with its bizarre collection of a gazillion fanboys who genuflect at the altar of all things Apple. Actually, Microsoft is positioning Surface Pro 3 as a contender against Apple’s 11-inch MacBook Air laptops. At the launch event today, Microsoft execs highlighted Surface Pro 3’s larger screen and lower weight vis-a-vis the MacBook Air. If you ask me, the Apple fanboys won’t be swayed. Truth be said, I fell off the chair when I noticed Surface Pro 3’s pricing (see table above). Insanity! But then strong weed does play havoc on the brain synapses. Surface Pro 3 starts at $799 for a device with Core i3 processor and mere 64GB storage (usable storage is 36GB). The Core i5 version is $999 and the Core i7 tablet will set you back $1,549. Keyboards and pens are separate. And the optional (but must-have) peripherals for Surface Pro 3 don’t come cheap either. Expect to see Core i5 versions of Surface Pro 3 in U.S. and Canadian stores starting June 20. Launch of other configurations and in other countries should follow two months later. If you’re as high as the folks at Microsoft’s Surface team, you can place your order starting tomorrow for the Surface Pro 3. I suppose what Microsoft did in NYC today with the Surface Pro 3 qualifies for what the cognoscenti term as Chutzpah in Manhattan.